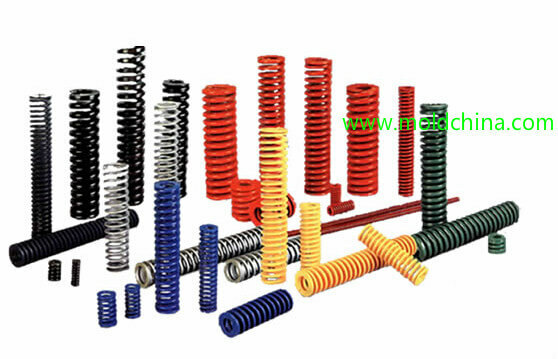 As one of the widely used elastic parts in molds, the springs are mainly used for the purposes of unloading, material pressing, pushing and ejecting. Based on different loading capacities, springs are marked with five different colors to make it easier to distinguish and select them. Spring outer diameters: Φ6, Φ8, Φ10, Φ12, Φ14, Φ16, Φ18, Φ20, Φ22, Φ25, Φ30, Φ35, Φ40 and Φ50, etc. The diameter of a spring hole should be 1 – 2mm larger than that of a spring diameter, and hide 20 – 30mm deep in the B plate. Usually, a mold needs to be equipped with RP springs, of which the hole diameter should be calculated as: ejection distance * 2 + 10mm, while spring length is depth of spring hole + 10mm. When automatic production is required for the mold, TR springs are often needed to be mounted under the RP. Spring preload is set between 5 – 10mm in the pre-action status. Spring preload is set to be over 10mm when return is first needed. When a mold is designed with the angle lifter mechanism without kiss off, it will not be necessary to mount springs under RP, so as to prevent the product from being pulled back by the lifter. The max deflection of a spring cannot exceed 40%. Mold springs exported to the US cannot be put on the return pin. The amount of preload is usually 10% of the free length. Usually, when mold ejector return spring is applied, instead of preload ratio, preload amount is adopted (often between 10 to 15mm). Note: Rectangular blue springs are mounted by the return pin. Due to their small inner bore sizes, it is not appropriate to put them on the return pins. A straight edge is required to be installed inside the spring (column pipe) to protect the spring from deformation. When the mold base is long and narrow (length approximately equal to 2*width), two more springs will be needed to be installed inside the plastic injection mold. It is required that springs are better mounted in a symmetric layout, and try to use springs with lager diameters. P = Preload is usually between 10 to 15mm, often identified according to resistance to return: the less the resistance is, the lighter the preload. S = Deflection, usually 30% – 40% of spring length. At last, the free length L has to be determined based on the above factors. Note: In the installation diagram, a return pin spring is in a preloaded status, of which the length L1 = free length – amount of preload. Design of slider retaining springs: The commonly used diameters are: 10mm, 13mm, 16mm, 20mm. Defection may be between 1/4 to 1/3. Often, two springs are used. Amount of preload is identified via calculation, slider preload = pressure / spring elastic coefficient; pressure on a vertical core pulling slider is equal to its dead weight; for horizontal core pulling sliders, the amount of preload may be 10% of the length; the free length L has to be determined based on the above factors. Slider springs should be stabilized. As a result, the installation hole of a spring cannot be too large. When the core pulling distance of a slider is large, a guide pin will be required to be installed. When the core pulling distance of a slider is large, but it is not convenient to install a guide pin, an external spring may be employed for retaining purpose.